Juvederm dermal filler was FDA-approved in June 2006 for the treatment of moderate to severe facial wrinkles and folds such as nasolabial folds (those lines that extend from your nose to the corners of your mouth). Juvederm is an injectable filler that includes hyaluronic acid, a natural complex sugar that bolsters skin elasticity, providing a smooth and supple appearance. It is biocompatible, supplementing the body’s natural hyaluronic acid, which age has depleted. Juvederm is the umbrella name for this family of products. Juvederm Ultra is the “regular” filler while Juvederm Ultra Plus is used to treat deeper facial folds; the effects of the latter may last longer. Newly developed Juvederm Voluma helps to restore volume to the cheeks and chin. Treatment areas include the deep nasogenian grooves (the folds between your cheeks and nose) and nasolabial folds (the so-called “marionette lines” that form between the nose and outer corners of the mouth). Juvederm is also useful for enhancing lip volume (often in combination with lip lifts) and for reshaping cheek contours. Other available hyaluronic acid-based treatments are Belotero injections, Perlane injections, and Restylane injections. Your plastic surgeon can advise you on which of these fillers is best for you. One advantage to Juvederm is its pliant gel consistency, which may provide a smoother, more natural-looking appearance than some of its more rigid predecessors. 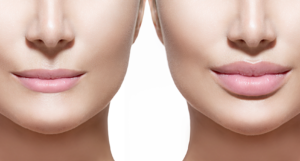 Another advantage is that Juvederm may last longer, maintaining the improved appearance for six to nine months. The benefits may last even longer if you have a follow-up treatment a few weeks after the first treatment.